1. Because you don’t know when it’s going to happen to you. It could happen tomorrow, it could happen next week, and it could happen in twenty years. But when it does happen, you don’t want to have become so cold-hearted that you can’t receive it. 2. Because if you’re honest, wanting to be numb to the pain that past loves have caused you (or the pain that comes from a lack of past loves), has not made you any happier. 3. Because the different kinds of love you are meant for in your lifetime ought to work alongside each other. If you close yourself off to one, it will probably affect them all. 4. Because even though wanting love can hurt, and it makes you vulnerable and leaves you open to be wounded, it still makes you stronger; the alternative makes you weaker. 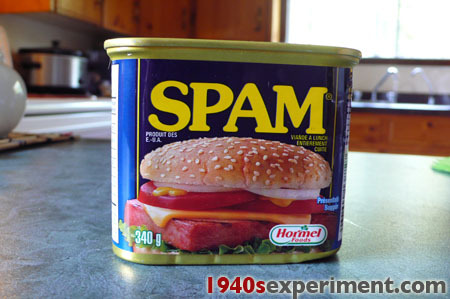 Spam Spam Spam Spam- everybody loves Spam.. The last time I ate Spam (and it has only been once until today) it was not a memorable experience. Infact I seen to remember I wretched as it slithered out of the can..
All that changes when you are HUNGRY and when your food choices are limited so for the sake of authenticity I decided to open the can of SPAM in the cupboard (which I bought 6 weeks ago) and cook with it as any good housewife would have done in the 1940’s. Would SPAM still be ikky? Could I physically eat the stuff given my inaugural exeperience? And what about the ethics? Would SPAM still be ikky…? There was yet another Islamic terrorist attack, this time against a satirical magazine in France. Twelve people dead because they believed in free speech. First off, let’s keep the people of France in our prayers. I know a lot of French people now. They’re good people. They don’t deserve this. Nobody deserves this. Second, to the moral equivalence crowd, and their inevitable cries about how everybody is all equally the same, and Christians and Jews have done bad things too, and their fears about the inevitable backlash against Muslims that never materializes because the west aren’t barbarians… To you people, to the smug, self-righteous leftists, go to hell.